Sectional garage doors consist of several panels, which are connected with hinges. These are also known as center hinges as opposed to the end hinges, which are found at the edges of each panel. The end hinges are the connecting point of the door and the garage door tracks. Since the movement of the door is possible thanks to the rollers that glide through the tracks, there is an end hinge secured on the edge side of each panel – apart from the bottom which wears a bracket. The garage door rollers run through the end hinges and thus the door moves up and down. One of the main distinctions among garage door hinges is their durability. This is defined by the thickness of steel and thus the number of steel gauge is an important consideration. You need to remember that the lower the gauge number, the thicker and thus stronger the hinge is. And so the heavier the garage door, the lower-gauge hinge you need. Take commercial garage doors. They are usually very heavy and large and so it is wise to operate with 11-gauge hinges. Since the upper part of heavy doors supports most of the door’s weight, it’s vital that the hinges installed at the higher points of the door are made of low-gauge steel. Now, most residential garage doors come with 18-gauge hinges. These are actually very thin hinges and thus susceptible to early damage and breakage. Although they might be alright for lightweight doors, it’s always best to get at least 14-gauge hinges for residential doors. Many garage door accidents occur when people’s fingers are trapped in the hinges. For the avoidance of such injuries, manufacturers have come up with innovative ideas. The safety garage door hinges leave no room for fingers and so accidents are out of question. There is usually a number stamped on garage door hinges. This number indicates the position of hinges on the overhead garage door and thus the vendor can send you the right product. #1 hinges are usually the center ones while the #2 ones are the end hinges. If you cannot find the number, measure the distance of the hinge from the bottom to the center of the top circle. In order to do that accurately, the hinge must lay on a flat surface. If the existing hinges broke earlier than expected, get stronger ones. In other words, get lower-gauge hinges. The more durable they are, the most expensive they get. 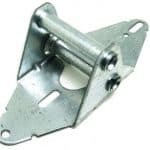 But overall, their price is not expensive and the cost difference is compensated by the longevity of the low-gauge hinges since they are durable enough to withstand stress. One last tip: lubricate the pivot points of hinges during garage door maintenance. Lubes help them operate silently and resist elements and thus corrosion that will require garage door hinges replacement.